TripShock is now offering two free dolphin cruise tickets with minimum 2 night stay for all hotels from Panama City Beach to Pensacola, FL. 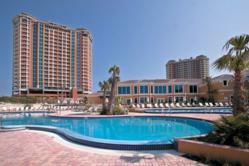 Portofino Island Resort and Spa, Pensacola FL. TripShock is now giving away 2 FREE Dolphin Cruise tickets with a minimum purchase of a 2 night stay for all hotels! The Gulf Coast is the perfect getaway for any relaxing or adventurous vacation. With attractions, lodging, and many restaurants to choose from, TripShock.com is offering some of the best deals for the Spring and Summer tourist season. TripShock is now giving away 2 FREE Dolphin Cruise tickets with a minimum purchase of a 2 night stay for all hotels from Panama City Beach to Pensacola Beach. Along with those two free dolphin cruise tickets for either afternoon or evening tours, guests could stay in the heart of Panama City Beach at Calypso’s exceptional resort. Calypso offers fantastic amenities, which include two beachfront resort style pools, a parking facility, unlimited complimentary DVD rentals and complimentary high speed Internet access. Complimentary seasonal beach service consisting of the use of two chairs and an umbrella for each day of your stay. In Pensacola, TripShock offers lodging at an exceptional 5 star resort, the Portofino Island Resort and Spa for a wonderful price. The Portofino is a quiet, secluded upscale resort set on an Island and located near the National Seashore. Each of the five condo towers has its own pool and whirlpool spa. There is also an Olympic Style indoor pool, two more outdoor pools and spas at the central club house area on the resort. The grounds are meticulously maintained with architectural landscaping features throughout. The ample palm trees and tropical foliage reflect the true Mediterranean style. Prepare a Gulf Coast vacation get away full of sunshine, sandy white beaches, great memories and unbeatable prices when booking through TripShock.com. TripShock! ® is the one and only travel agency that enables travelers to book accommodations, tours, and activities online directly for the Northern Gulf Coast. TripShock! offers trusted reviews from real travelers, photos, videos and other planning tools to help create the perfect Gulf Coast vacation. TripShock! attracts more than 500,000 visitors annually and partners with over 100 activity and lodging providers from Florida to Louisiana.